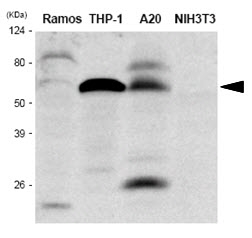 Western blot analysis of IRF5 expression in a range of cell lines using Mouse anti Human IRF5 (MCA2701). Formalin fixed, paraffin embedded normal human colon and colon adenocarcinoma stained with Mouse anti Human IRF5 (MCA2701) following heat mediated antigen retrieval using 0.1M citrate buffer (pH6.0). Mouse anti Human IRF5 antibody, clone 10T1 recognizes human interferon regulatory factor 5 (IRF5), a ~58 kDa member of the IRF family which acts as a key regulator of interferon gene transcription, and is expressed in B cells and dendritic cells, and is inducible by type I interferon (IFN) in most lymphoid cells. The role of IRF3 and IRF7 as transcriptional mediators of virus- and IFN-induced signaling pathways is well documented. Studies have shown that IRF5 can also regulate IFN gene transcription, but appears to be more restricted in its cellular expression and range of viral stimuli, and has the ability to induce a wide range of chemokines involved in T-lymphocyte recruitment, including RANTES, MCP-1 and IP-10 (Barnes et al. 2002). Histidine-tagged recombinant peptide corresponding to amino acids 176-240 of human IRF5, purified from E. coli. Spleen cells from immunised Balb/c mice were fused with cells of the mouse Sp2/0 myeloma cell line. 1This product requires antigen retrieval using heat treatment prior to staining of paraffin sections.Sodium citrate buffer pH 6.0 is recommended for this purpose. MCA2701 detects a band of approximately 58kDa in THP-1 cell lysates. Pabois, A. et al. (2016) Notch signaling mediates crosstalk between endothelial cells and macrophages via Dll4 and IL6 in cardiac microvascular inflammation. Barnes, B.J. et al. (2002) Multiple regulatory domains of IRF-5 control activation, cellular localization, and induction of chemokines that mediate recruitment of T lymphocytes. Mol Cell Biol. 22 (16): 5721-40.